George Salamis has been the President and CEO of Integra Resources Corp since 2017. He has over 25 years of experience in the mining and resource exploration industry, and has been involved in over $1.4 billion of M&A transactions, either through assets sales or his involvement with junior mining companies. He co-led the efforts behind the 2016 Integra Gold Rush Challenge, co-founded the #DisruptMining accelerator challenge in 2017 and acted as a judge of the 2018 #DisruptMining challenge, initiatives that encourage innovation and technology disruption in the mining industry. Integra Resources is a development-stage mining company engaged in the acquisition, exploration and development of mineral properties in the Americas. Its management team comprises the former executive team of Integra Gold, who sold their Lamaque Gold Project to Eldorado Gold for $590m in 2017. 1- Canada’s rich mineral resources contain all the necessary elements to build the products and support the sectors that will drive the global future economy, such as smartphones, electric vehicles, renewable energy installations and urban infrastructure. 2- Mining companies today are becoming more collaborative, sharing more data, embracing technology and aiming for a collective win-win through technological innovation. 3- Canada’s expertise in both mining and technology should be integrated to form a new mining technology sector. This technological innovation will not only make the mining industry safer and more economically efficient, it will also make mining more environmentally sustainable. The mining industry must create “skunk work” projects within its organizations and once and for all embrace radical disruption and technological change. And those in tech must create “skunk work” projects that build ideas and concepts to revolutionize mining. How important is mining for Canada’s present and future economy? Canada was founded on our natural resources and mining expertise, which we export around the world. We are known for our ability to mine the vast resources in our own backyard to fuel the economy and build communities. There is a clear trend in the worldwide economy towards clean energy, smart urban infrastructure and a green economy. None of these elements could exist without the minerals that we mine in Canada. For example, all the conductors that go into making an iPhone like aluminum, graphite, lithium, gold, silver and copper, are extracted in Canada. It is the same with electric vehicles, renewable energy sources and urban infrastructure; Canada has all the essential elements required to ‘build’ the future economy in its backyard. The mining sector can achieve considerable sustainable growth in the future because we are coming from a place of stagnation. Until now, the industry at large has not incorporated new technologies. Canada can really shine on the global stage if we take our mining leadership and expertise and meld it with the advanced technologies of the 21st century. How do you see the development of Canada’s mining industry being reconciled with Canada’s commitments to the sustainable and clean growth of our future economy? I think it is a question of leading by example. The Canadian mining industry leads the way in responsible mining with initiatives that not only further reduce the environmental footprint of operations, but also create sustainable economies in the communities around them. Companies are spending millions of dollars building ‘mines of the future’, introducing new technologies that will make their operations more sustainable. For example, Goldcorp’s Borden Mine in Northern Ontario will be the first battery-electric mine, replacing diesel mobile equipment with battery electric vehicles. You have called for the “uberization” of the mining industry. What do you mean by that and what tangible steps would you like to see being taken in that direction? “Uberization” is a catchall phrase for modernizing and digitizing an old-world industry, which is what mining is. For example, we are using drones, artificial intelligence and machine learning to find new deposits, and it is really starting to catch on. It’s about the spirit of resourcefulness in the resource economy. And we are seeing this through digitization. I still feel that the Canadian government is lagging when it comes to fostering technology in the mining space – there is a lot more that can be done here. Our greatest competitive advantage in Canada is our natural resources. 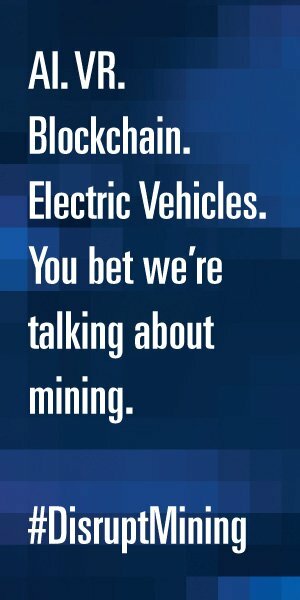 Governments are very focused on the so-called “digital economy.” Let me say this, mining can be part of the digital economy! There is immense opportunity for applications of knowledge in the resource-based economy. Natural resources are Canada’s leading competitive advantage. More work needs to be done to cultivate this future opportunity. We are slowly starting to see a technological shift in the mining and exploration programs at Canadian universities. We need more of it because automation and digitization is happening underground. Instead of young people with traditional training, we are seeing an influx of young people with digital backgrounds entering the mining business. Last year at the #DisruptMining live finale, David Garofalo, CEO of Goldcorp, stated that in the future, every mining company will need to be a technology company. He’s absolutely right. Canada’s mining future looks bright because we are leading the industry’s technological revolution. We have come a long way in the last five years, but still have a long way to go. How can we increase intra-industry collaboration and partnerships – effectively, between competitors – to accelerate the ideation and implementation of positive outcomes for Canada’s future mining industry as a whole? In the mining industry, companies and leaders most often keep their cards very close to their chest; they do not tend to play well and easily together in the sandbox. We are slowly witnessing a shift in this mindset. Mining companies today are becoming more collaborative, sharing more data, embracing technology and aiming for a collective win-win through technological innovation. 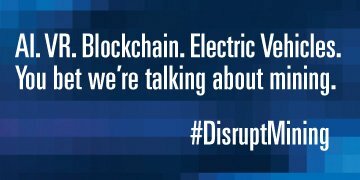 Initiatives like #DisruptMining are key. For the first time, we have an open forum to share innovative solutions for mining. Moreover, the mining industry needs to start promoting itself as a value creator for the future Canadian and global economy. We are not good at conveying this message because for some reason we are afraid to stand up and say: “Hold on a second, look at us differently. Look at us as the producers we are. We produce all those materials that go into your iPhones and the circuit boards that give you the ability to run AI and machine learning.” Think about it, where do smartphones, electric vehicles, renewable energy sources and urban infrastructure come from? If it’s not grown, it’s mined. One thing I would like to see in Canada is the creation of a learning institution like Singularity University in the US, but specifically for mining. This kind of institution would be well-funded by industry and government, and would become a breeding ground for phenomenal ideas; ideas we can introduce into the mining sector that will make it more efficient, that will make operations cleaner, and make the industry more accessible to disruption by ideas from other sectors. Which areas of mining have the most potential for disruption in the coming years? I think the biggest change and disruption will happen in exploration – how we discover gold and other metals and minerals. It’s going to be about how we collect data in real time and what we then do with that data. We are excited about what we can do with AI and advanced analytics to help make new discoveries. Right now, when we explore for a gold deposit, we spend a lot of money drilling a core sample into the earth’s crust. It is a one to two kilometer long drill hole and we have to wait for weeks and months for the data to be extracted out of that core sample. So, there is no real-time element whatsoever in that process. The future is going to be about how we collect data in real time and what we then do with that data. We are excited about what we can do with AI and advanced analytics to help make new discoveries. And that future is here! Goldspot Discoveries, an alumni from the Integra Gold Rush Challenge in 2016 and a 2017 #DisruptMining finalist, is the first AI company in mining. They are using machine learning to help guide decision-making in exploration. We will be able to explore less and find more by applying advanced data science. There is a great company called KORE GeoSystems, a past winner of #DisruptMining, that is working on real-time data collection as you drill. In other words, smart drilling. You know the second you are drilling into a major ore body, which is a transformative innovation. Canada has tremendous expertise in mining, and there are many regions across the country where you will find large pools of really smart, talented, tech-oriented people. All we need is for these two sectors to collide and start working together. We are in the early days of this collision and the potential is enormous. A whole new sector could be created around mining technology in Canada. This technological innovation will not only make the mining industry safer and more economically efficient, it will also make mining more environmentally sustainable. It’s about responsible mining to build our collective future.